Have you ever passed up potential friendships and opportunities to be part of a group because you were afraid you wouldn’t be accepted, or you would wind up getting hurt? Have you ever trusted someone too quickly only to be disappointed or hurt by them? Most of us have experienced both situations at one time or another. Although we may find it hard to risk vulnerability to form new relationships, many of us would agree that having close friendships is important to us. 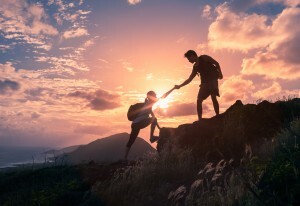 Research has recently discovered a positive correlation between life satisfaction and connectedness to others. Quality relationships are now seen as one of the important ways we cultivate joy in our lives. Relationships are built on trust and are created when we risk becoming vulnerable with another person. Too often in my practice, I hear the statement, “You can’t trust anyone nowadays.” When someone we trusted hurts or disappoints us it reinforces the message that it is not safe to be vulnerable and to trust others. However, if we operate under the assumption that everyone is untrustworthy we diminish our ability to form important and fulfilling relationships. On the other hand, if we trust too quickly or put our trust in people who have not earned our trust we will often experience pain and feel unsuccessful in establishing fulfilling friendships. If only there was a way for us to mitigate our risks and increase our chances of success in cultivating quality friendships, joy and increased life satisfaction. Brene Brown, a well-known author and researcher out of the University of Houston has developed a way to help mitigate the risk associated with trusting others. She created an acronym that can be used to assess with whom and where we can appropriately place our trust. The acronym is BRAVING. Boundaries: Before I place my trust is another person and share with them things about myself that would make me feel vulnerable I first ask myself if this person respects my boundaries. Do they ask if something is okay and do they accept “no” for an answer or are they often pushing me to do things their way? Reliability: Does this person consistently follow through with commitments they make to me. Can I count on them or do they often overpromise and then disappoint? Accountability: Does this person hold themselves accountable for their choices and mistakes? Are they willing to apologize, accept consequences and make amends when appropriate? Vault: Does this person share information and secrets that are not theirs to share? Can I count on them to hold my confidences? Observing how they handle the confidences of others can give you an idea of their abilities in this area. Integrity: Does this person choose living in their values over rolling wherever the tide takes them? Do they make the hard choices and stick by them or do they take the easy way out? Non-Judgment: Can this person be honest about their needs and beliefs and at the same time accept that my needs and beliefs may be different? Generosity: Does this person give me the benefit of the doubt or do they assume the worst about my words and actions? The beauty of this acronym is that it can be applied to trusting others and it can be applied to self-trust. Think of someone with whom you are having trust issues. Apply the BRAVING questions to explore why trust has become a problem with this individual. Then apply the question to yourself in a situation where you are having a hard time trusting your decisions. Clarity on where trust is being challenged will help you address the problem areas to increase trust in the future.